The Oshwal Centre is a very popular venue for Hindu and Tamil weddings. It’s one of our favourite venues and this is because of the stunning temple and really beautiful landscaped gardens. We are their number one premier supplier and we typically shoot around 4-8 weddings here each year. It's an ideal Asian wedding venue offering a generous amount of space for all manner of events and the building has benefitted from an excellent recent refurbishment program. This venue offers a combination of traditional hand carved exterior decor on its temple with modern touches inside the function hall too. The hall has been fitted with smart LEDs that can be changed to any colour by the caretaker using an iPad. We would strongly recommend keeping the LEDs to a natural white colour so we don’t get strange skin tones shift in the images and to ensure that we get consistent results in all our cameras. Colour shifts can be extremely hard to correct but it can be impossible for your videographer to correct and usually they will set up large white LED panels which can block the guest’s view. When the function hall is dressed in white colour, the hall is extremely well lit with soft defused light which makes our life as a photographer easier as we only need to set up one small wireless flash which has a very small footprint and won’t block anyone’s view. The ground floor hall is capable of hosting Indian wedding events with a maximum guest capacity of 500. The lower level is the dining hall which is an ideal spot to serve your guests during the wedding breakfast. I have covered many celebrations here over the years and it has always been an enjoyable experience and Kirti-bhai and the Oshwal team have always been very welcoming to us and all our clients. 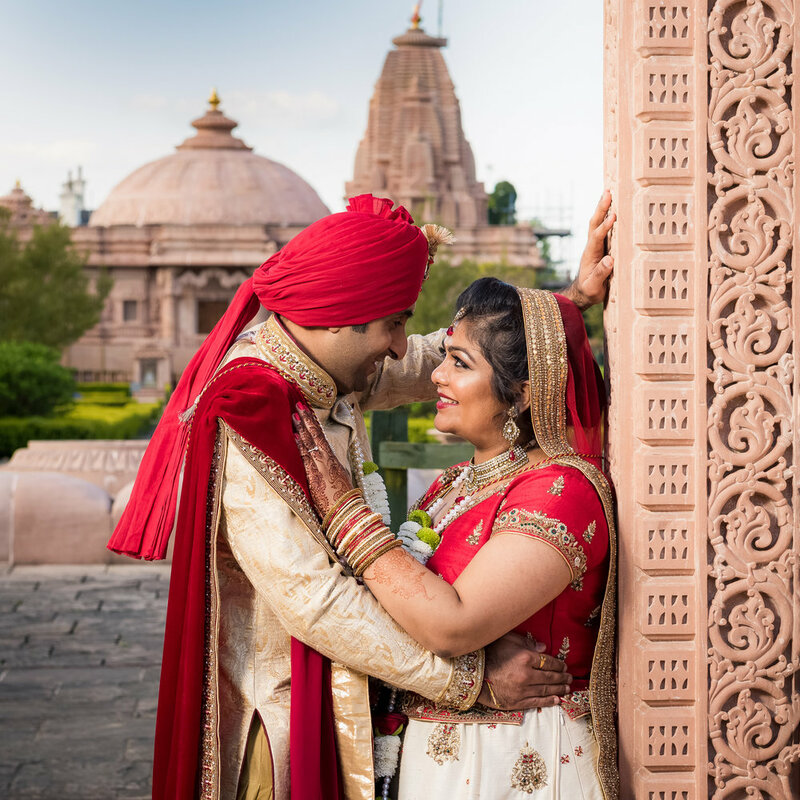 The traditional temple structures and grounds is a great location for creating natural timeless couples’ portrait. It is one of the more popular Asian wedding venues so get your enquiries in early to avoid disappointment. Have a look at some of the weddings we have covered at this stunning venue.